Welcome to Wear Me Jewels! Handcrafted artisan jewelry by designer Aimee Addison. Welcome to Wear Me Jewels! Experience the unique handcrafted jewelry of designer Aimee Addison. These whimsical designs embrace reflections of the natural world with a sweet vintage look that has an enduring and timeless quality. Each piece is created by hand using high quality natural brass, sterling silver, copper, bronze, freshwater pearls, stones, and beads. 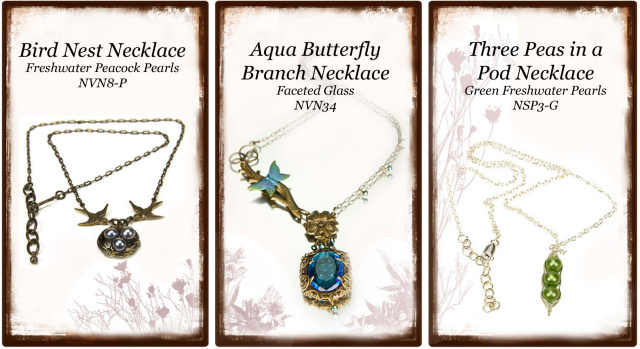 With jewelry collections like the Peapod Collection, Vineyard Collection, and Dogwood Flower Collection, Wear Me Jewels designs seek to achieve a classical elegance that whispers of nature and calls out to the buyer, "Wear Me! ".